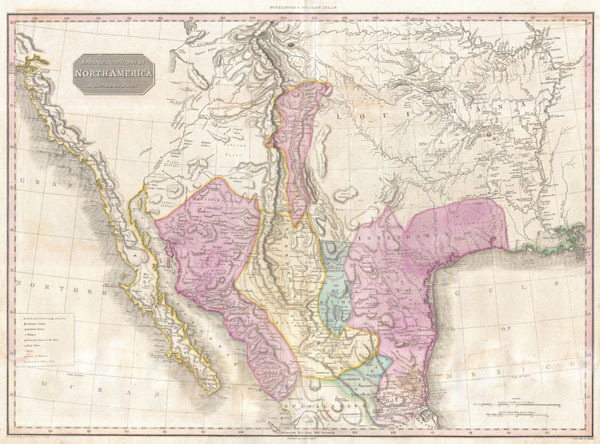 The finest commercial map of the American southwest to appear in the early 19th century. Spanish Dominions in North America Northern Part. Possibly the finest commercial map of the American southwest to appear in the early part of the 19th century. Produced by John Pinkerton and based largely on the explorations of Alexander von Humboldt, this map Covers from the San Francisco Bay to the Mississippi Delta and from Lake Timpanagos (Great Salt Lake area) to Veracruz and Guadalajara. Though ostensibly similar to John Thompson's map of the same region, Pinkerton's map in fact a far different and vastly superior map. The entire map is flush with a level of detail that is nothing short of astounding. Pinkerton utilizes a cleaver engraving technique to represent the vast plains west of the Mississippi. Numerous important Spanish colonial cities and missions are named, including Santa Fe, Albuquerque, and the city of 'Pres del Bejar, Capital of the Province of Texas.' New Mexico is reduced form a formerly vast territory to a relatively narrow strip of land attached to the Rio Norte (now the Colorado River). Much of modern day Texas is part of the Intendancy of San Louis de Potosi. Shows both Lake Timpanagos (Great Salt Lake) and Lake Teguayo (Utah Lake) with some accuracy regarding form. The apocryphal River Buenaventura flows eastward from Utah lake into the Rocky Mountains. In the Great Plains, Pinkerton provides a unusual wealth of detail, some drawn from preliminary accounts of Lewis and Clark, but most derived from other sources. Many of the great rivers systems are shown in considerable detail including notations on portages and navigability. Identifies the hunting grounds of numerous American Indian tribes, including the Apache, Acoma, Pawnee, Delaware, Juma, Comanche, and others. Along the west coast numerous missions are noted including the Mission of San Francisco, the Mission of San Diego, Santa Barbara, San Buenaventura, etc. All in all a remarkable map and a must for any serious collection focused on the American Southwest. Drawn by L. Herbert and engraved by Samuel Neele under the direction of John Pinkerton. This map comes from the scarce American edition of Pinkerton's Modern Atlas, published by Thomas Dobson & Co. of Philadelphia in 1818. Very good condition. Minor discoloration along original centerfold. Minor dampstaining in lower quadrants - see image. Blank on verso. Rumsey 0732.045. Phillips (Atlases) 724. National Maritime Museum, 409.